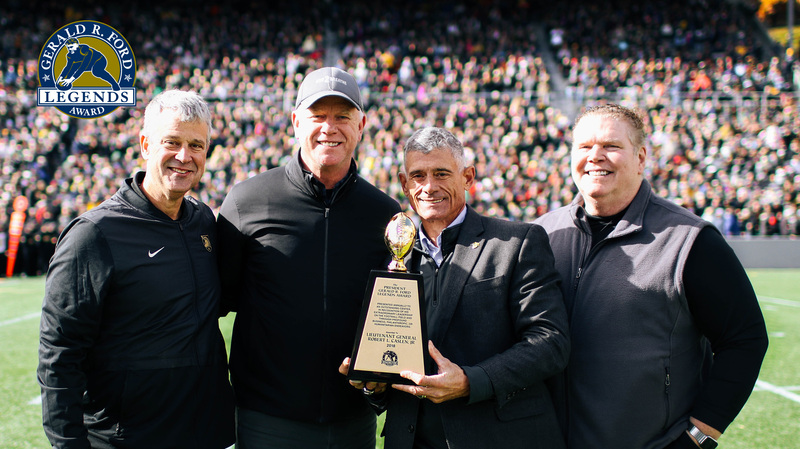 NEW YORK, N.Y. – The Rimington Trophy Committee proudly announced Lieutenant General (Ret) Robert L. Caslen, Jr. as the 13th recipient of the Gerald R. Ford Legends Award for his distinguished service and leadership in the U.S. armed forces on Saturday, November 3 at the Army v. Air Force football game. After being created in 2005 by the Rimington Trophy and the office of President Gerald R. Ford, the Ford Legends Award has been presented annually to a former collegiate or professional center who, like the award’s namesake, distinguished himself above and beyond the football field. "I am honored to receive this award, particularly under the namesake of President Gerald R. Ford,” Caslen said. “Knowing the character of President Ford and what he stood for makes it even more special. I have always admired how he filled in as our President when our Nation needed him the most. And it was an honor to have had him as my West Point class' graduation speaker in 1975. I also want to thank the Boomer Esiason Foundation for the work that they do with this award, and I look forward to working with them as well." Caslen graduated from the U.S. Military Academy in 1975, where he played center on the football team. He then went on to earn master’s degrees from Long Island University and Kansas State University. More recently, he was the 59th Superintendent of the U.S. Military Academy at West Point for five years, during which he oversaw the resurgence of the Army football program. Prior to that assignment, he served as the Chief of Office of Security Cooperation-Iraq. Caslen’s prior deployments and assignments include serving as the commander of the Combined Arms Center at Fort Leavenworth, Kan., the command that oversees the Command and General Staff College and 17 other schools, centers, and training programs located throughout the United States; commanding general of the 25th Infantry Division (Light) and commanding general of the Multi-National Division-North during Operation Iraqi Freedom; Commandant of Cadets for the U.S. Military Academy; Deputy Director for the War on Terrorism, J-5, The Joint Staff; Assistant Division Commander (maneuver), 3rd Infantry Division (Mechanized); Chief of Staff, 10th Mountain Division (Light); Chief of Staff, Combined Joint Task Force Mountain during Operation Enduring Freedom; Commander, 2nd Brigade, 101st Airborne Division (Air Assault); Chief of Staff, 101st Airborne Division (Air Assault); Senior Brigade C2 Observer/Controller, Operations Group, Joint Readiness Training Center; Commander, 1st Battalion, 14th Infantry, 25th Infantry Division (Light); Executive Officer to the Deputy Commander in Haiti during Operation Uphold Democracy; J-3 in Honduras for Joint Task Force Bravo; Brigade Operations Officer, 3rd Brigade, 101st Airborne Division (Air Assault); Executive Officer, 2nd Battalion, 187th Infantry, 101st Airborne Division (Air Assault) during Operation Desert Shield/Desert Storm. Caslen’s awards and decorations include the Defense Distinguished Service Medal, the Distinguished Service Medal with Oak Leaf Cluster, the Defense Superior Service Medal with Oak Leaf Cluster, the Legion of Merit with four Oak Leaf Clusters, the Bronze Star Medal with two Oak Leaf Clusters, the Defense Meritorious Service Medal, and the Meritorious Service Medal with five Oak Leaf Clusters. He has earned the Combat Infantryman Badge, the Joint Chiefs of Staff Identification Badge, and is Airborne, Air Assault, and Ranger qualified. He will be officially presented the Gerald R. Ford Legends Award on January 12, 2019 at the Rococo Theatre in Lincoln, Nebraska. The Gerald R. Ford Legends Award was founded in 2005 by the Rimington Trophy and the office of President Gerald R. Ford, naming President Ford as the first recipient. Annually, it is presented to former collegiate and professional centers who, in addition to standout football careers, have also made significant contributions in the football, business, or philanthropic communities. The Ford Legends Award was created to help draw more attention to the center position, the main goal of the Rimington Trophy. Previous recipients include: Joe Montgomery (William & Mary), Carl Mauck (Southern Illinois), Jeff Saturday (UNC), Courtney Hall (Rice), Dermontti Dawson (Kentucky), Jay Helgenberg (Iowa), Mick Tingelhoff (Nebraska), Dwight Stephenson (Alabama), Jim Ritcher (NC State), Bill Curry (Georgia Tech), Alex Kroll (Rutgers), Jim Otto (Miami), and President Ford (Michigan).